​Some things in life are better when they come in three’s like the Three Musketeers, The Supremes, three piece suits and who doesn’t love it when their favourite team ‘does the treble’. What would Larry be without the other two Stooges, Curly and Moe, Charlie without his three Angels and the Two Amigos just doesn’t have the same ring. 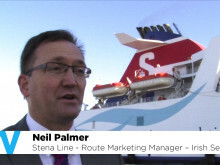 ​Europe’s tallest man sails into town to launch Stena Line’s BIGGEST EVER hotel break sale EUROPE’S tallest man sailed into Ireland today to reveal details of ferry company Stena Line’s biggest ever hotel breaks sale.